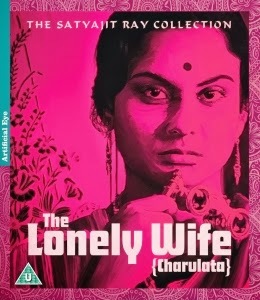 The years 1964-5 saw the release of Satyajit Ray’s arguable masterpiece The Lonely Wife (Charulata) and the smaller variation on a theme, The Coward (Kapurush), both now reissued in pristine Blu-ray versions by distributor Artificial Eye. Set in the closing years of the nineteenth century, The Lonely Wife tells the story of a privileged woman, Charulata (played by the luminous Madhabi Mukherjee), whose wealthy husband Bhupati (Sailen Mukherjee) is committed to producing a political newspaper, and whose main pleasure is the smell of newsprint and the sound of his own voice. With the arrival of her brother-in-law, the Bohemian poet Amal (Soumitra Chatterjee), Charulata begins to realise her yearning for something different both in finding her voice as a writer and her unfulfilled romantic longings in the lighter more attractive brother. Ray takes the conventional premise of the desperate housewife and creates something astonishing, a subtle and measured examination of frustration, love and duty. With the exception of an overly dastardly villain in Charulata’s perfidious brother, all the characters are full and sympathetic. The melodrama is also restrained, and Ray’s attention to detail imbues the tale with watchful beauty. A companion piece to The Lonely Wife in some ways, The Coward also features an unhappy marriage and a meditation on missed chances and lessons learnt too late. Chatterjee now plays Amitabha Roy, a screenwriter searching for local colour for his new script, who finds himself stuck in the middle of nowhere when the taxi he is travelling in breaks down. A pipe-smoking manager of a nearby tea plantation, Bimal Gupta (Haradhan Bannerjee), offers to put him up for the night in his bungalow and give him a lift in the morning. However, on arriving at the house the guest recognises the owner’s wife as Karuna (Mukherjee), a woman who he was in love with at university but who he lacked the courage to commit to. Whereas The Lonely Wife takes Charulata’s perspective sometimes literally, even using point-of-view, Karuna’s unknowability tortures Roy and remains a mystery for the audience throughout. With its meta-commentary on filmmaking, The Coward could be Ray’s meditation on the making of The Lonely Wife, as well as standing as a kind of sequel. Amal, like, Roy have both committed a cowardly turning away from love and abandoned their women to unhappy domestic duty. A smaller film – a fact reinforced by its 74-minute runtime – The Coward also reveals a more isolated Indian reality than The Lonely Wife. Gone is the relative-infested house and the bustling streets outside. Surrounding Bhupati and Karuna’s bungalow stretch miles of countryside with no one they can talk to due to their self-imposed class divisions. Either of these two films on their own would provide an excellent primer to one of world cinema’s great auteurs, but a double-bill of The Lonely Wife and The Coward would perhaps be the best introduction of all.